Our morganite engagement ring collection has grown even bigger. Just in time for the summer, we have added a stunning array of morganite engagement rings that feature emerald cut center stones. An emerald cut morganite is refined and has step cut faceting. We have taken this elegant gemstone shape and combined it with some of our most popular engagement ring settings. 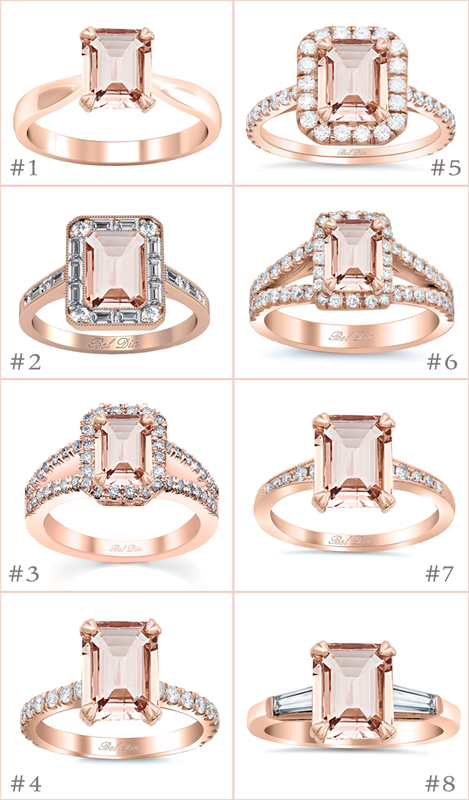 Each of these engagement rings will be set one a 2.50 carat emerald cut morganite, which is beloved because of its romantic, peachy pink hue. Each setting may be made in your choice of gold (14 kt or 18 kt), palladium, or platinum. To learn more about each of these engagement rings, simply click on the photo of the ring or click the numbered item below. 1. Tapered Emerald Cut Morganite Solitaire Engagement Ring, currently starts at $945.00. 2. Emerald Cut Morganite Baguette Diamond Halo Rose Gold Engagement Ring, currently starts at $3272.00. 3. Rose Gold Split Shank Emerald Morganite Halo Engagement Ring, currently starts at $2062.00. 4. Pave Diamond Engagement Ring for Emerald Cut Morganite, currently starts at $4140.00. 5. Rose Gold Halo Engagement Ring for Emerald Morganite, currently starts at $2662.00. 6. Split Shank Pave Diamond Morganite Halo Engagement Ring, currently starts at $2062.00. 7. Tapered Pave Diamond Engagement Ring for Emerald Morganite, currently starts at $1280.00. 8. Emerald Cut Morganite and Baguette Three Stone Engagement Ring, currently starts at $1499.00. Please view all of our morganite engagement rings to see our entire collection that is currently offered. Aside from the new emerald cut morganite rings, we also manufacture round, cushion, heart, oval, and pear shaped morganite engagement rings. Choose from our simple solitaire settings or select a ring that features a diamond band or diamond halo. Please contact our jewelry designers if you are interested in creating custom morganite engagement ring.